Is it time to plant things in central Ohio? Saturday, May 11, 2013 is the annual Plant Fest in Worthington. 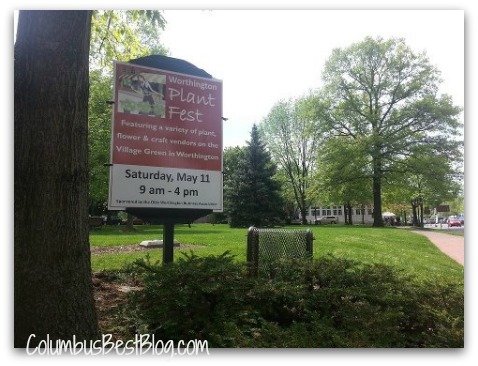 The Plant Fest on the Worthington Village Green is 9:00 AM to 4:00 PM Saturday, May 11, 2013. The calendar says it is time to plant. I was talking to a central Ohio arborist a week or so ago who told me we are about two weeks ahead of normal. Last year was not normal. Chris Bradley says we could have frost Sunday night / Monday morning… I read the Channel 10 TV meteorologist’s weather warning on Facebook. There are other plant events in central Ohio on Saturday. The Garden Market in German Village and Gahanna has Herb Day Saturday. There is a ‘Plant Sale and Gardening Fair’ at Chadwick Arboretum, May 10 to 11, 2013. Another 1920s inspired event t the Ohio History Center / Ohio Village is on Saturday evening. Their event ‘Pleasure of the Cup – Drinks of the Speakeasy’ is Saturday, May 12, 2013 at 7:00 in the evening. It is time for the Gay Street Moonlight Market. The first Gay Street Moonlight Market was in April. The event is the second Saturday each month from April through___. Nice enough weather for an outdoor market. Sunday, May 12, 2013 at the Columbus Zoo with MOM! 2013 Columbus City Tour Series from the Columbus Historical Society. Color Mania 5k Walk/ Run is coming to Columbus June 8th. REGISTER NOW!